The Granary Building from King's Boulevard. Old brickwork on the arse of the Granary Building. 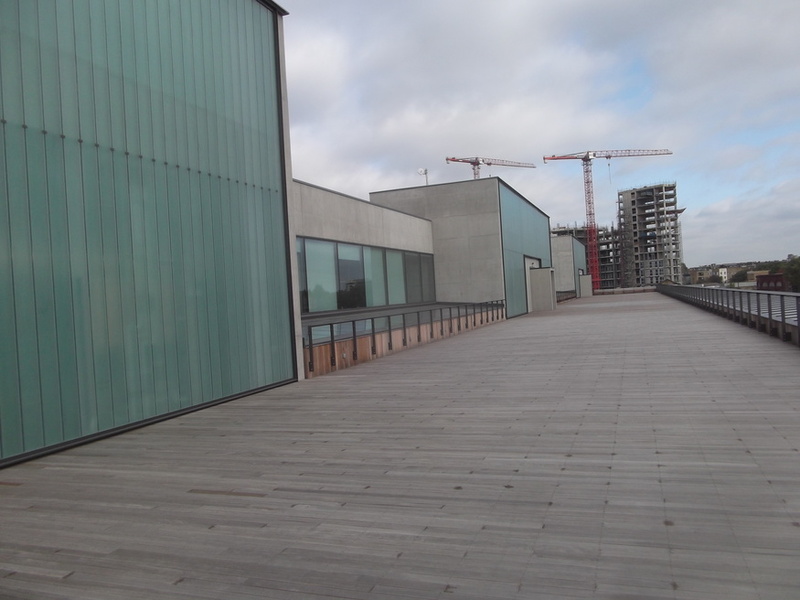 A maaaasive roof terrace on the east side. Looking down on an architecture class. Our alma mater only had a knackered vending machine. 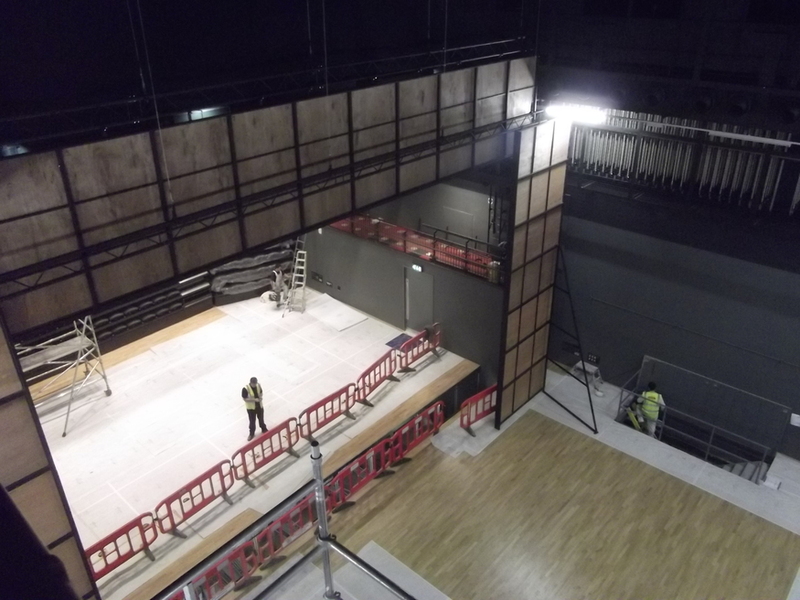 Looking down on the main theatre space. One of the jewellery workshops in the East Transit Building. The central atrium, as photographed from the library. View from the library window out onto Granary Square. Everywhere you look, old features marry up to modern additions. Image by John Sturrock, courtesy of Central Saint Martins. Interior of the Granary Building, showing the mix of materials. Image by John Sturrock, courtesy of Central Saint Martins. The Eastern Transit Shed, now filled with classrooms, workshops and studios. Image by John Sturrock, courtesy of Central Saint Martins. 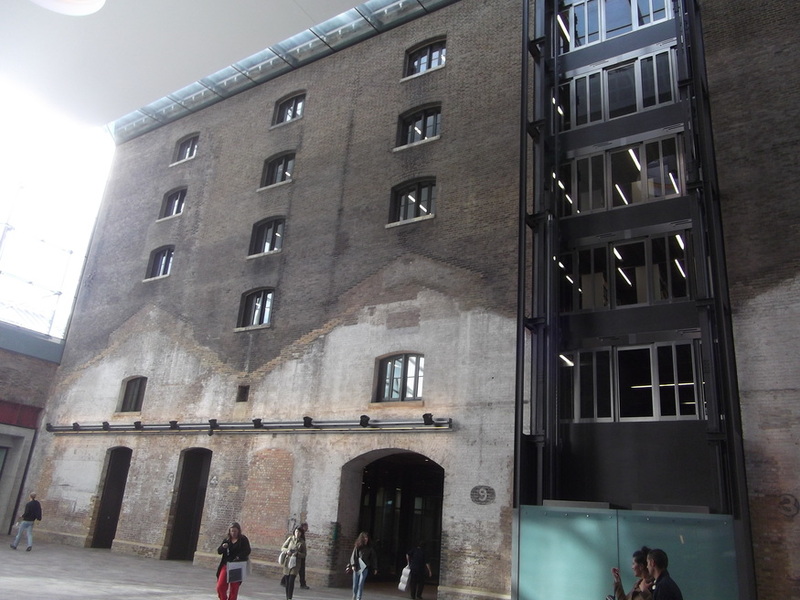 The imposing Granary Building at the back of King's Cross was built in 1851 as a giant warehouse for London's grain. 160 years later, it is flowing with the seeds of Britain's creative industries. 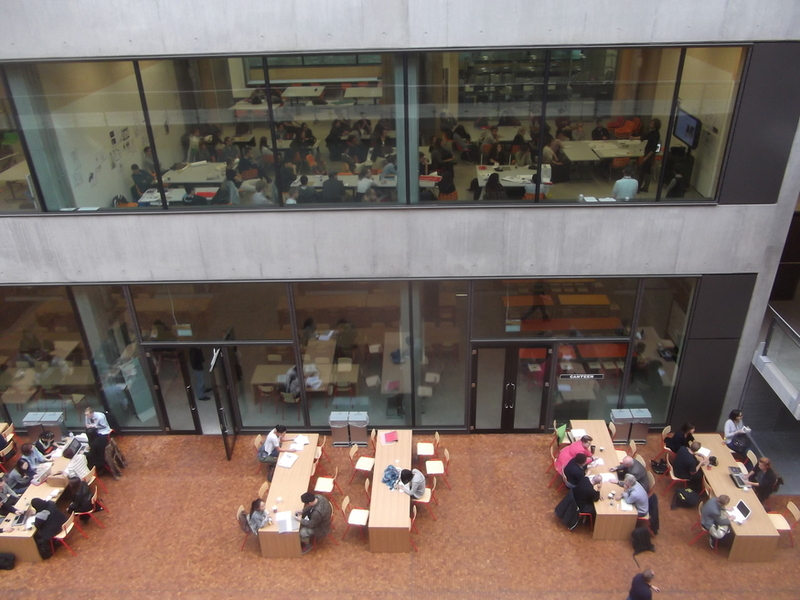 Thousands of students and postgrads have just moved into the re-engineered store and its satellite buildings, the new home for Central Saint Martins (CSM). The £200 million transformation is stunning. 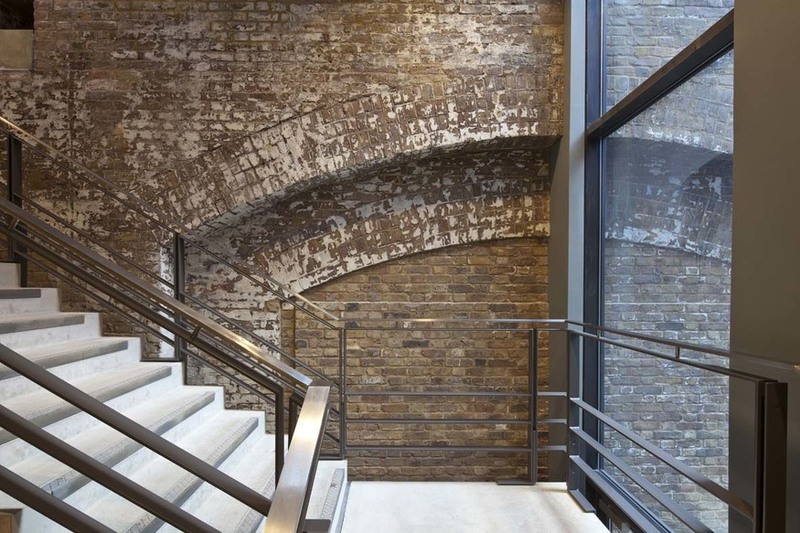 The Grade II Granary Building itself is a marvel of Victorian steel and brickwork married with the lightweight materials of the modern age. Old scars remain – most evident on the building's backside, a patchwork quilt of mis-matched brick. It looks like it's had one hell of a good spanking (see photos). But in a nice way. The big surprise lurks behind the Granary Building, which turns out to be little more than an impressive facade for an elephantine campus. A vast central atrium stretches north, crossed by numerous bridges between floors. Either side of the atrium, classrooms, workshops and studios cluster into two former train sheds. 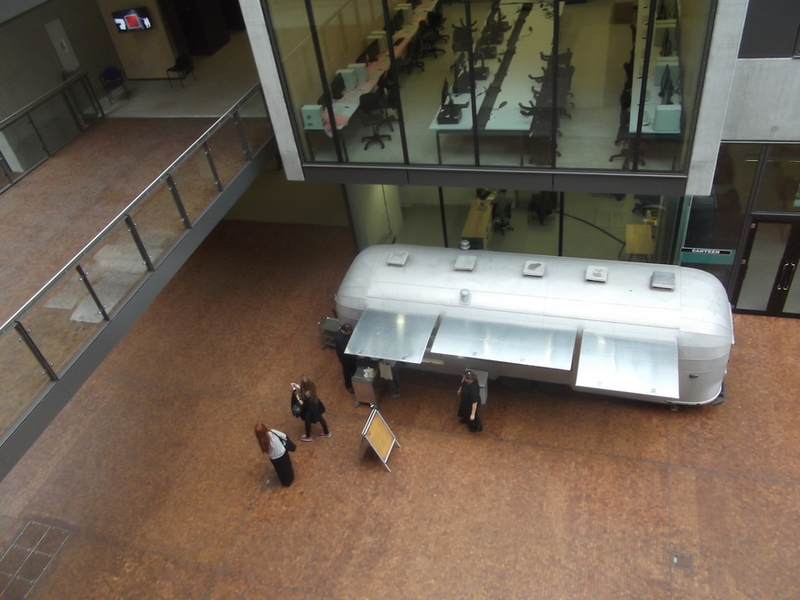 Throughout the buildings, generous amounts of casual work space and meeting points should get people mingling. It's an immense complex. The decision to move the college to this site was taken just after the collapse of Lehman Brothers in 2008; not the most relaxed time to be investing millions in a major project. 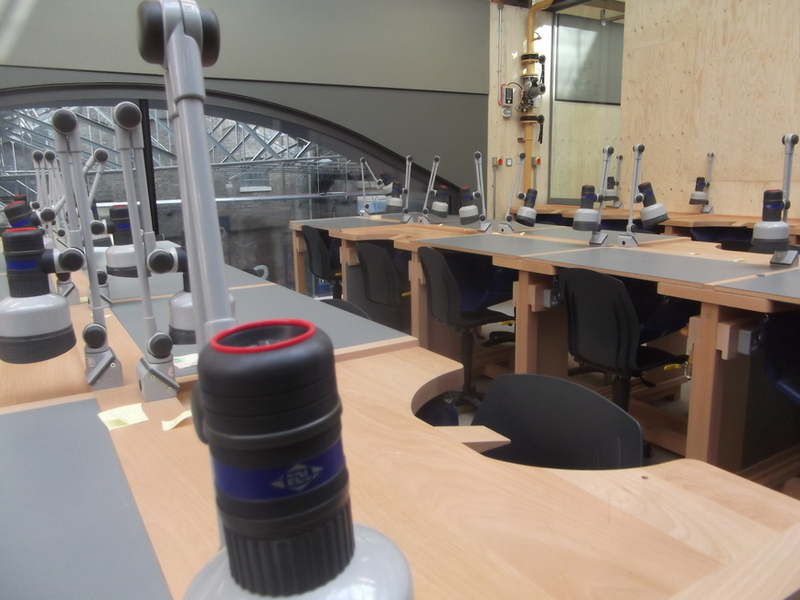 The University of the Arts (of which CSM is one of six colleges) provided most of the capital and must be relieved that the developers brought in the project on time and on budget. The new home brings together departments from several CSM properties in the hope of stimulating chinwags between folk of different creative persuasions. 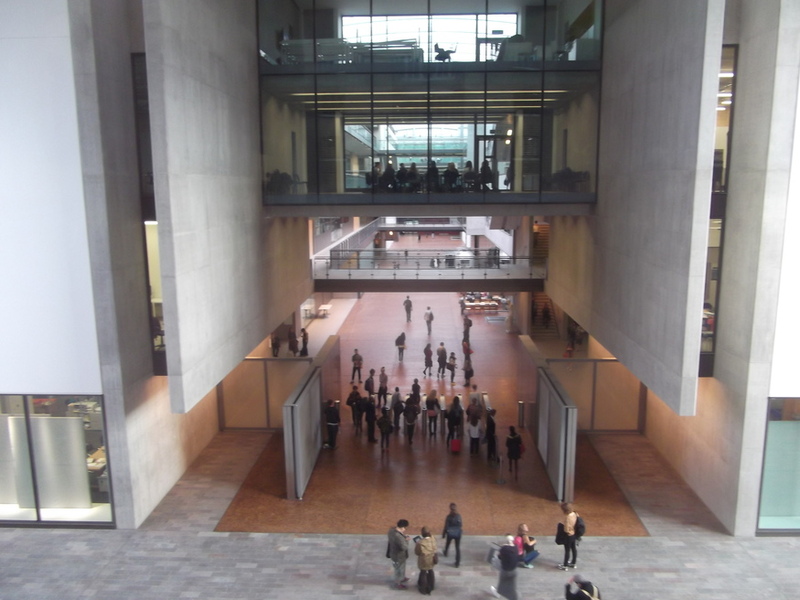 "We must now live up to the building," asserted Jane Rapley, Head of CSM. As well as nurturing the next generation of creative types, the college will also welcome the public at large with theatrical productions, art shows and other events. 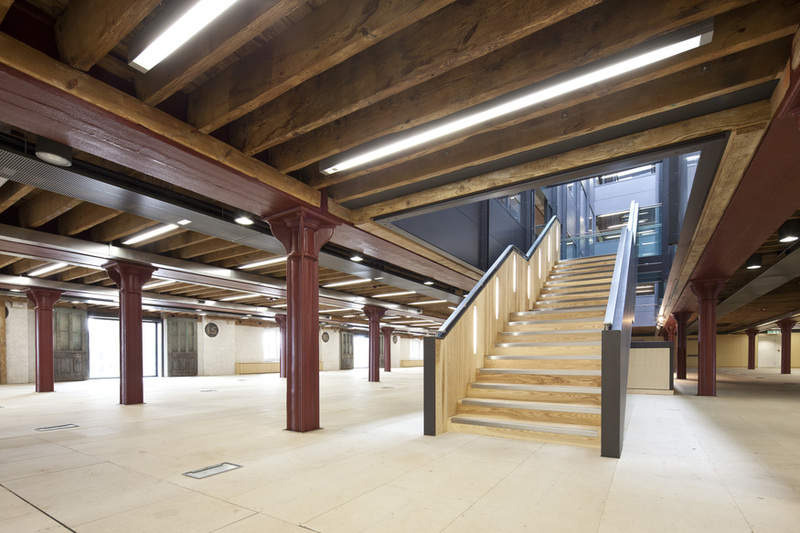 The ground floor of the Granary Building and part of the atrium space behind are public thoroughfares, and you can stop by any time to take a look. 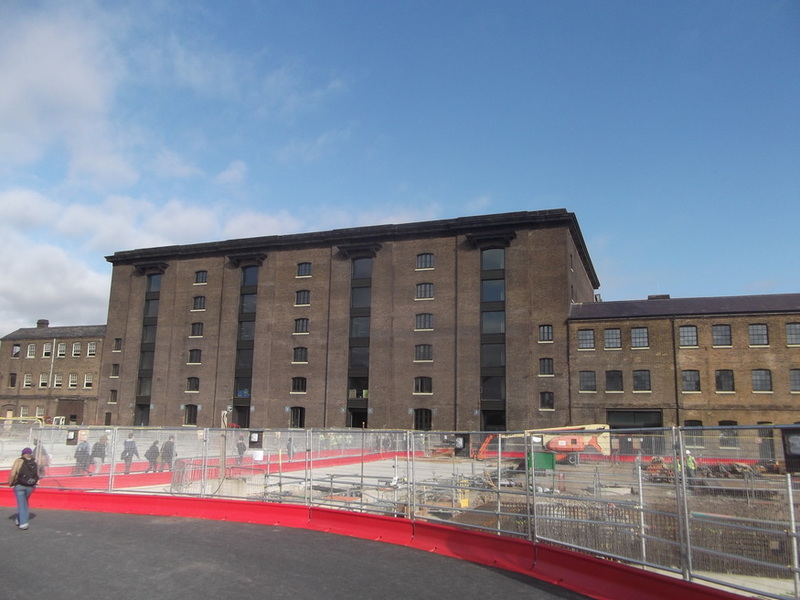 The opening is a major notch on the crowded height chart of King's Cross's regeneration. It started with the arrival of the British Library at the end of the last century. Kings Place brought performing arts and gallery exhibitions to the area, while the Guardian offices above added a mouthpiece. The Regent Quarter to the south contributed numerous quality restaurants and bars, while serving the needs of small and creative businesses. The coming of the Eurostar, refurbishment of St Pancras, and expansions to King's Cross underground and Thameslink greatly improved transport provision. There's still plenty more to come. 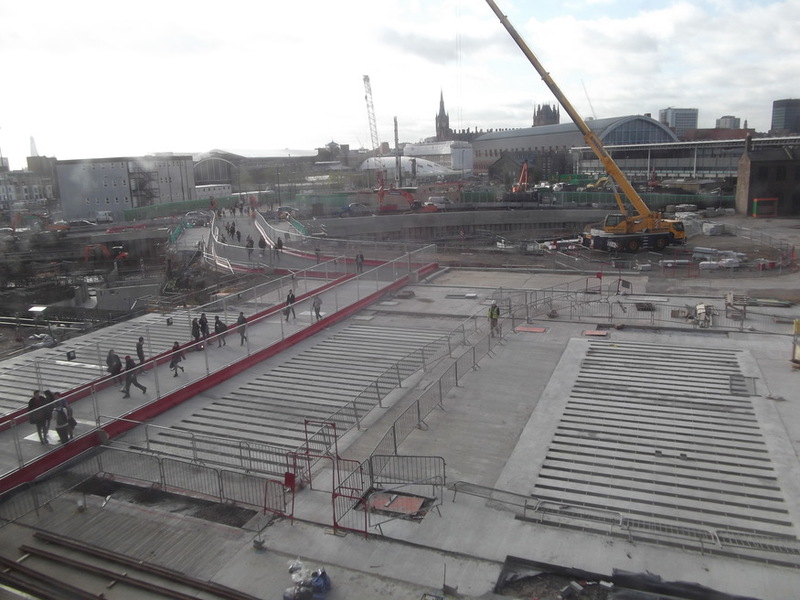 The new ticket hall at King's Cross should open early next year. Work has begun on a major medical research centre behind the British Library. And, right in the middle of this decadal doughnut of development, hundreds of offices, homes and shops are under preparation. 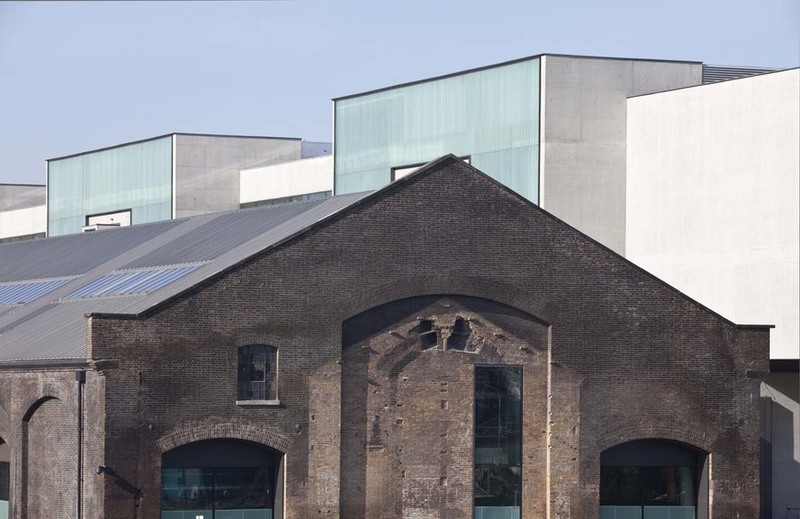 But of all these initiatives, the opening of Central Saint Martins feels like a turning point in this generation-long reinvention of King's Cross. You can't drop 5,000 young, creative minds into an area without fundamentally changing the character of that area – and emphatically for the better.